How to subtract mixed numbers? 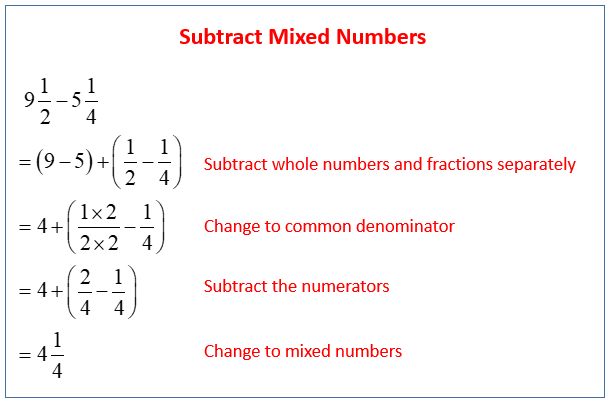 We will look at two methods that can be used to subtract mixed numbers. We can convert the mixed numbers to improper fractions and then subtract them as fractions. 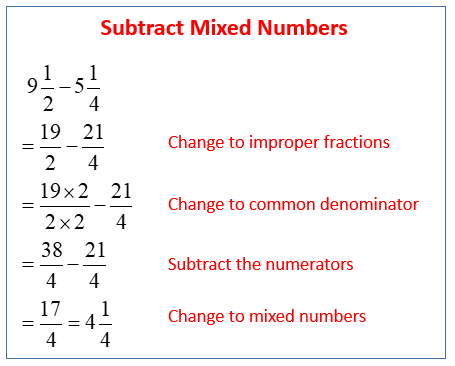 The following example shows how to subtract mixed numbers by first converting them to improper fractions. Scroll down the page for more examples and solutions. The following video gives another example of subtracting mixed numbers using method 1. We can subtract the whole number part and the fractional part of the mixed numbers separately. 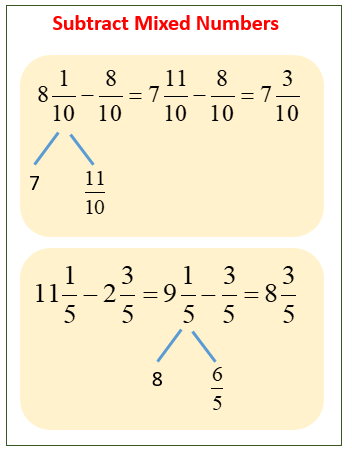 The following example shows how to subtract mixed numbers by subtracting the whole number part and the fractional part separately. Scroll down the page for more examples and solutions. The following video gives another example of subtracting mixed numbers using method 2. If the fractional part of the second mixed number is bigger than the fractional part of the fixed number then it would be necessary to "borrow" from the whole part before subtracting. The following example shows how to subtract mixed numbers with borrowing. Scroll down the page for more examples and solutions. The following video shows how to subtract mixed numbers with borrowing.